I don’t like to deal in absolutes, but when it comes to achieving fat loss, YOU HAVE TO BE IN A CALORIE DEFICIT. Put simply, you need to be burning more calories than you are consuming. So you either need to eat less or more or both! Weight Gain is caused by a (prolonged) caloric surplus. They ALL ensure you consume less calories. 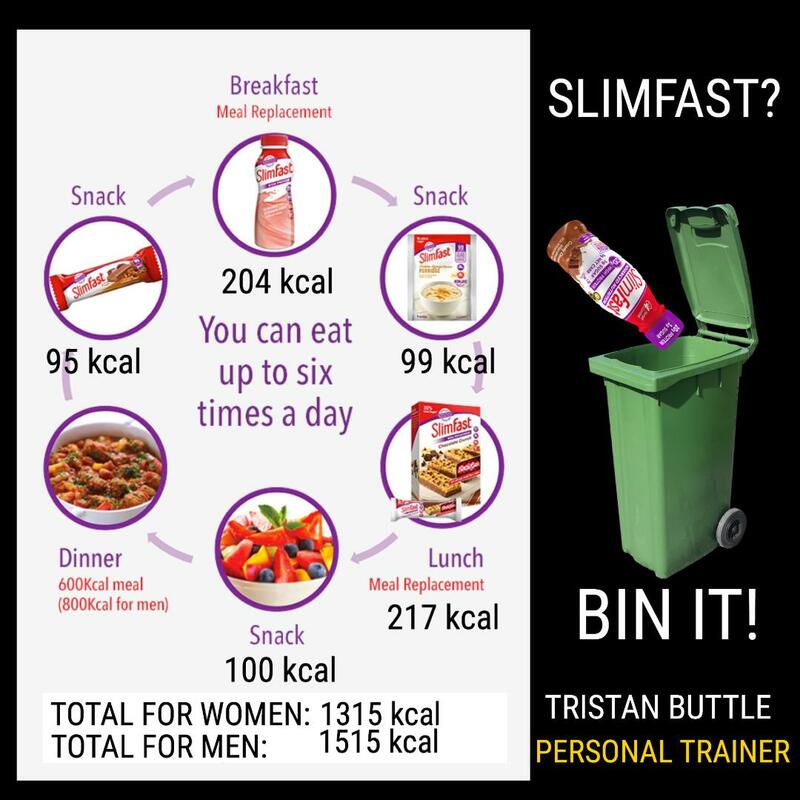 Some companies such as Slimfast will have you believe that their overpriced products are somehow the answer to your fat loss issues. I looked into their ‘3.2.1’ plan & did some quick sums.. this is a simple exercise to highlight how many calories an individual would eat following this plan. It’s clear why this plan results in weight loss due to this caloric restriction!! It’s one meal a day and a range of very low calories snacks! It’s not magic, it’s not educational, it’s not enjoyable, it’s not flexible, and above all else it’s not sustainable! A deficit can be achieved in a variety of methods & no one approach suits everyone. What is the highest (not lowest) number of calories you can consume to achieve your goals? This will prevent you from starving yourself, setting unsustainable targets and stop you from crashing & burning out and giving up on your goals… (remember calories are a unit of ENERGY). Consider getting the MOST from the LEAST in the beginning stages of fat loss. eg: lets say someone drastically drops their calorie intake, starts training more than before and does extra cardio/classes all within the first couple of weeks, where does that person go from that point? I often describe this as playing all your cards at once. You need to think long term. If you lose the weight drastically, you may gain back it drastically…. P.S -Don’t listen to Alexandra Burke or any other celebrity who is being paid to endorse anything that you don’t need.